This PDF 1.6 document has been generated by , and has been sent on pdf-archive.com on 03/02/2017 at 18:20, from IP address 98.6.x.x. The current document download page has been viewed 220 times. File size: 341 KB (54 pages). 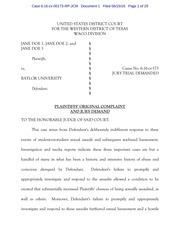 BAYLOR UNIVERSITY, DR. DAVID E.
JAMES CARY GRAY, RONALD D.
three Baylor Regents that was untruthful and without merit. 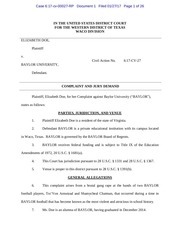 and other former members of the Baylor football staff under Coach Briles all have been defamed. not reported to appropriate Baylor personnel. anything the Baylor Regents have said or done. Their friendship dates back to 1988, when they both worked at Stephenville High School. budgets and supervising administrative personnel. 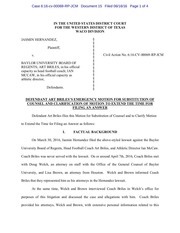 the Athletics Department or to make sure his players were punished, if warranted. 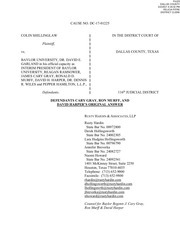 that support the position in which Shillinglaw placed himself and others. of misconduct were treated differently than students outside the program. 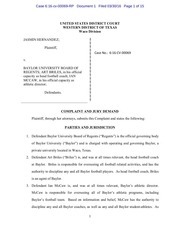 Hamilton investigators and Baylor confidentiality guidelines. be the University’s definitive statement on the crisis. drastic steps to change the culture in the football program. media consultant, G.F.BUNTING+CO, to help formulate responses to incoming media inquiries. many of the truthful articles at issue in this lawsuit. doubt fearing the truthful response to his allegations. assistants did to foster a non-compliant culture within the football program. 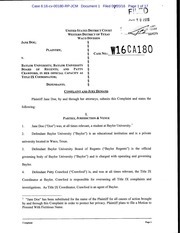 Why Baylor hired Pepper Hamilton to investigate troubling allegations. transferred from Boise State University back to his home state of Texas in 2013.
Who Pepper Hamilton is and what the firm was asked to do. and Occidental College. Leading the Pepper Hamilton team are Gina Maisto Smith and Leslie M.
to respond to sexual assault allegations. This file has been shared by a user of PDF Archive. Document ID: 00548706.